What a way to close the amazing two weeks that has been The Festival of Voice 2018. A festival that has seen some great performances ranging from one of Wales’ favourite musicians, Gruff Rhys, performing with a 72-piece orchestra to an intimate evening with American Punk royalty Patti Smith in St. John’s Church. Here at the tail end of a fortnight, Elvis Costello stands as the sonic vanguard to the procession of musical excellence. 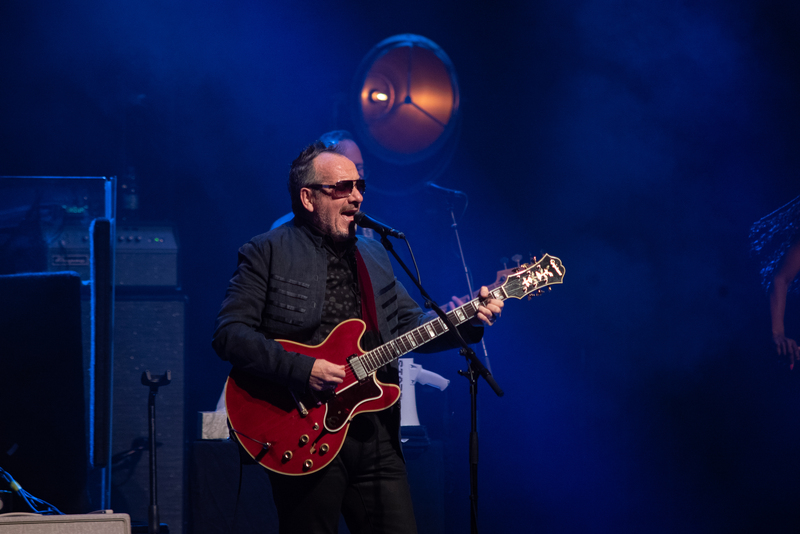 In the shining beacon of Welsh musical culture that is the Millennium Centre, Costello brought the house to its feet during a two-hour extravaganza that showcased the highlights from a career spanning nearly 40 years encompassing reggae through to soul by way of rock and roll. Diving straight in without a support act, Costello hit the ground running alongside his long-serving band the Imposters, with a rendition of Wonder Woman which immediately got the appreciative crowd clapping along and set the tone for the first half of the show. The addition of the beautifully soulful backing singers Kitten Kuroi and Brianna Lee lent an epic gospel feel to the upbeat Rock and Roll of ‘Everyday I Write The Book’ and ‘Pump it Up’. Especially when he reappeared after a mid-set break with just the three of them sharing one microphone at the very lip of the stage to perform a haunting rendition of the heartbreaking ‘Alison’. The highlight was definitely the combination of Elvis Costello, his red fedora and crooning conjuring images of a smokey Parisian lounge bar, and Steve Nieve lending his virtuoso piano skills to the evening, with just the two of them onstage performing stripped back versions of ‘Oliver’s Army’ and ‘Accidents Will Happen’; Costello also anecdotally told us how the original cut of the song didn’t have the piano ending because they ran out of tape. Whilst still comfortable with the more upbeat Rock and Roll, Costello’s husky tones shone brightest during the slower, more nuanced jazz numbers. Reviving the more upbeat feel towards the end he brought the house to its feet with ‘Peace, Love and Understanding’ which seemed the logical conclusion point but then continued with a couple of slightly slower numbers which seemed a bit out of place compared to the otherwise well-planned setlist. Still, Costello’s show was tight and the audience was eating out of the palm of his hand. Nobody came to be converted; everyone there was already a firm believer in Costello and his music. 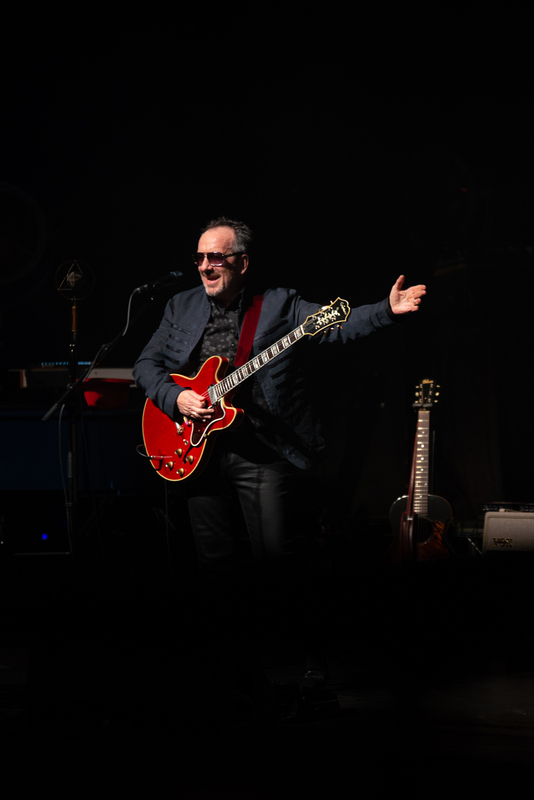 As the crowd rose to their feet and Costello and his fellow musicians soaked in the rapturous applause, you would be hard-pressed to think of a more suitable closing act to the festival of voices. One that was genre-spanning, crowd-pleasing and moved the heart as much as the feet.